Artwork Panel: 30.4cm x 54.3cm ≈ 12" x 21¼"
Silk/Brocade: 39.4cm x 110.5cm ≈ 15½" x 43½"
Width at Wooden Knobs: 48.4cm ≈ 19"
Reason for discount: Very minor silk flaw. Almost invisible, but I am picky about quality! In Japanese, this word means innocent or one with no knowledge of good and evil. It literally means "without mind". This is one of the five spirits of the warrior (budo) and is often used as a Japanese martial arts tenet. Under that context, places such as the Budo Dojo define it this way: "No mind, a mind without ego. A mind like a mirror which reflects and dos not judge." 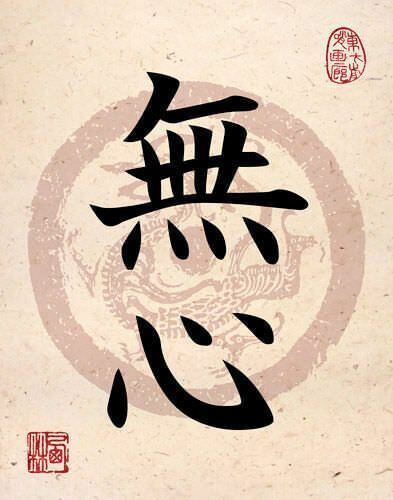 The original term was "mushin no shin", meaning, "mind of no mind." It is a state of mind without fear, anger, or anxiety. 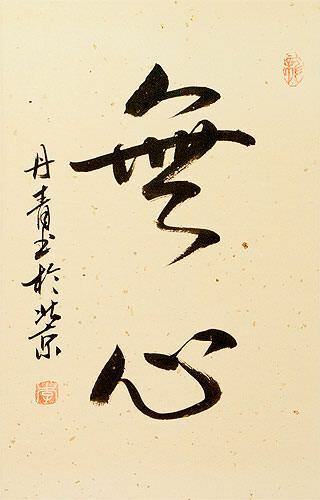 Mushin is often described by the phrase, "Mizu no Kokoro", which means, "mind like water". The phrase is a metaphor describing the pond that clearly reflects it’s surroundings when calm, but whose images are obscured once a pebble is dropped into its waters.